How does Peppermint handle dual monitor support. 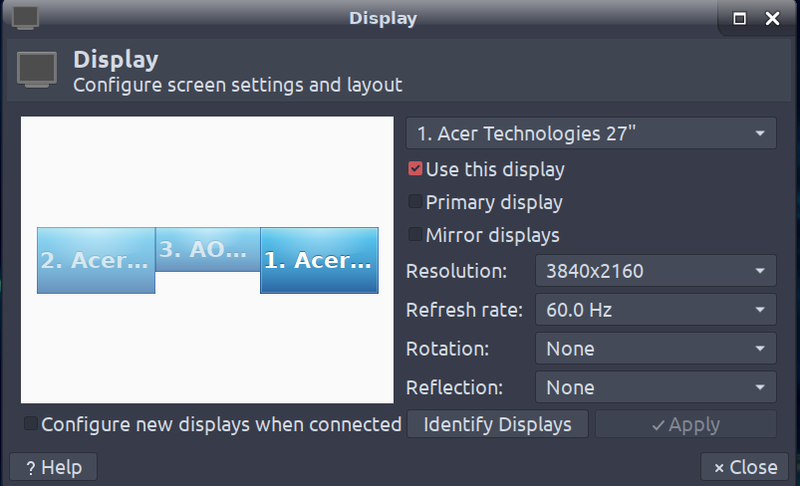 I want to be able to drag items from one monitor to the other instead of a cloned monitor display. I'll wait for Zebedeeboss to answer this .. but it's definitely possible. Which graphics card do you have ? Smile! - It makes people wonder what you're up to. I'm running P9 respin on a Dell 7010 with a cheap video card, not even sure what it is, and dual monitors work just fine. Just had to tweak the display settings from the hardware section of the Peppermint Settings Panel. You just grab the top of whatever you want to move and start dragging. You will then see a Graphical Representation - mine has three screens your's will have two. You are looking for the wording "Mirror Displays" - you will want to have this unticked. Make sure your Displays are in the right positions - if not simply drag them and move them around to the setup you wish. Click apply and you should now have two displays that you can move items too and from.